The Checker Marathon is best known as the iconic New York City taxicab. It’s also one of the cars that saw the least changes in its lifetime, with a 1960 model looking just about identical to the last ones made in 1982. 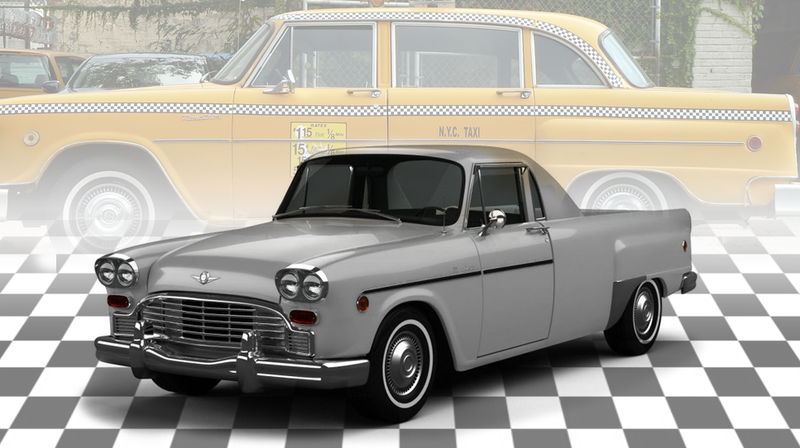 And Hemmings reports that now it’s coming back, but not in the old, expected, four-door sedan/taxicab form, but as a six-doored limo and an amazing Checker pickup truck. A Chekechero? Checkermino? This is all thanks to the Low Volume Motor Vehicle Manufacturer’s Act of 2015, which makes it much easier for small car companies making fewer than 500 cars/year, as long as those cars are some sort of replica of a previous model. Checker has said they expect to be in production by next year. Checker fits this general category, but they are pushing the boundaries a bit with their introduction of Checker Marathon-based models that Checker never produced, like their pickup. The six-door limo, though, is something Checker produced. Checker made six-and eight-door cars called the Aerobus, in trunk’d and wagon forms. According to Hemmings, these new Checkers won’t be made from old parts, or even with legacy equipment, because all that stuff is long gone. All new parts will be used, though pains have been taken to insure that the new chassis will allow original Checker bodies to bolt right on, and at least 40% of the newly designed parts should be able to work with vintage Marathons as well. The resurrected Checkers will keep the tradition of Checker using GM engines, in this case LS-series V8s, with an optional diesel. I’m especially excited about this pick-up. I think the design lends itself surprisingly well to a truck format, and these Checker pick-ups may be the closest thing to a genuinely non-colossal pickup option in the U.S. market. Checkers were never small cars, but next to a new F-150, I bet this thing will almost feel like a compact truck. That bit of door trim on the side doesn’t really work though. Checker might agree with me, because in this rear view, it’s gone. Steve Contorino, the head of Checker Motor Cars, told Hemmings that they plan to build between 300 and 500 of the hexadoor’d limo, and a few less of the Checkecheros. They’re targeting a price between $40,000 and $50,000, which, in context, isn’t terrible. I’m pretty happy to see Checker come back, personally. I always liked their dogged refusal to change with the times, and I think a Checker-based smallish truck is exactly what the truck market needs right now, which is probably why I never get asked to be in focus groups.